Mango (Mangifera Indica) is one of the most nutritious and tasty fruits and is correctly known as The king of fruits. It excels in its flavor, taste, nutrition and heath benefits. Mango health benefits including in cancer, high cholesterol, high blood pressure, pregnancy, skin, etc. are discussed below. Mango contains a variety of phytochemicals and nutrients including dietary fibre, calcium, vitamins, minerals and potassium. Mangoes are high in energy, low in fat, sodium free and cholesterol free. A mango contains more than 25 different vitamins and minerals, so it may be called a superfood. Percentages are roughly approximately based on US recommendations for adults. There are several health benefits of eating mangoes to the body. You should always eat ripe and fresh mango. Mango fruit is an excellent source of Vitamin A, Vitamin C and beta-carotene. Mangoes gives you more beta-carotene, an antioxidant, than any other fruit. They can help fight the signs of ageing by assisting with the growth and repair of cells, tissues and skin. The antioxidant is also essential for vision. Consumption of fruits rich in carotene is known to protect the body from lung and oral cavity cancers. Vitamin C, an important antioxidant is required in the formation of collagen, that gives structure to bones, cartilage, muscle and blood vessels, besides it protects you from infections. Vitamin C also helps in the absorption of iron in the body. Vitamin A is required for maintaining healthy mucus membranes and skin. One cup of sliced or diced mango makes two servings. Mangoes are low in calorie and high in dietary fiber, 100 g mango (about half a mango) provides only 60 calories and 1.6 g fiber; and it is free of fat, cholesterol and sodium, so eating mangois good for weight loss. Mangoes are low GI food (41-60), so their energy (calories) comes mainly from carbohydrates. This energy is absorbed slowly into the body, which helps maintain healthy blood sugar levels, and keeps you satisfied for longer. Include a mango as a snack or even as part of a healthy meal without any fear of putting on weight. Research has shown that eating mangoes can protect against many many cancers including colon, breast, leukaemia and prostate cancers. 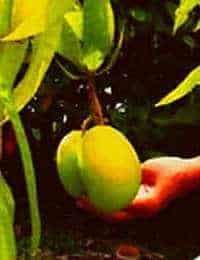 This anti-cancer benefit comes from the presence of poly-phenolic antioxidant compounds including quercetin, isoquercitrin, astragalin, fisetin, gallic acid and methylgallat in mangoes. The high levels of dietary fiber and vitamin C help to lower cholesterol levels. High potassium in mango helps to regulate blood pressure, controlling heart rate and muscle contraction. The high amounts of vitamin A and vitamin C and several carotenoids in mangoes keep the immune system healthy and strong. Mango high Iron content, 160 mg in 100 g mango) is beneficial to people with anemia and pregnant women. Note that mango is not only safe to eat during pregnancy, but it provides vital nutrients to the pregnant woman. However, eating too much unripe mangoes during last trimester may cause bleeding and can thus lead to miscarriage, as it is considered a warm fruit. No wonder, many old womwn advise not to eat raw mangoes during late pregnancy. Mango can also treat acidity and poor digestion because of an enzyme found in the fruit which soothes the stomach. This enzyme breaks down protein like papaya, helping digestion. Due to the high content of fiber, eating ripe mangoes can be helpful in preventing constipation. Fiber can be helpful in preventing colon cancer and high blood pressure and high cholesterol levels. Mango gives us moderate amounts of copper which helps in the production of red blood cells. Eating mangoes and applying externally on the skin can be helpful in clearing clogged pores and eliminate pimples. The mangoes have high content of vitamin A, which promotes good eyesight and prevents night blindness. Drinking fresh ripe mango pulp in milk by making a mango smoothie or mango-milk shake is good for gaining weight. Drinking a drink of green mangoes helps to cool down the body and prevent harm due to heat. Other benefits of eating mango that have been reported are Asthma Symptoms, Constipation, Diarrhea, Dysentery, Eye Disorders, Fever, Hair Loss, Heat Stroke, Infections, Kidney Problems, Liver Disorders, Menstrual Disorders, Morning Sickness, Piles, Prickly Heat, Respiratory Problems, Skin Clogged Pores, etc.